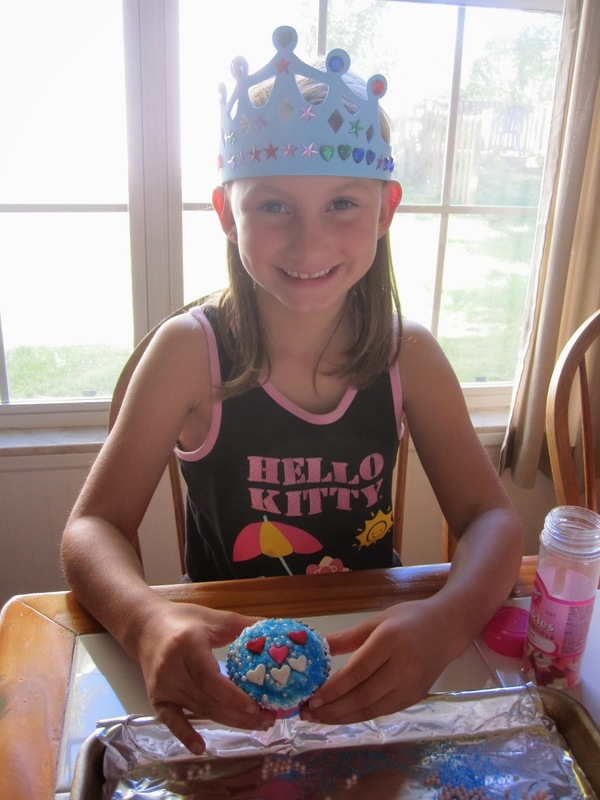 My princess Little E turned four! 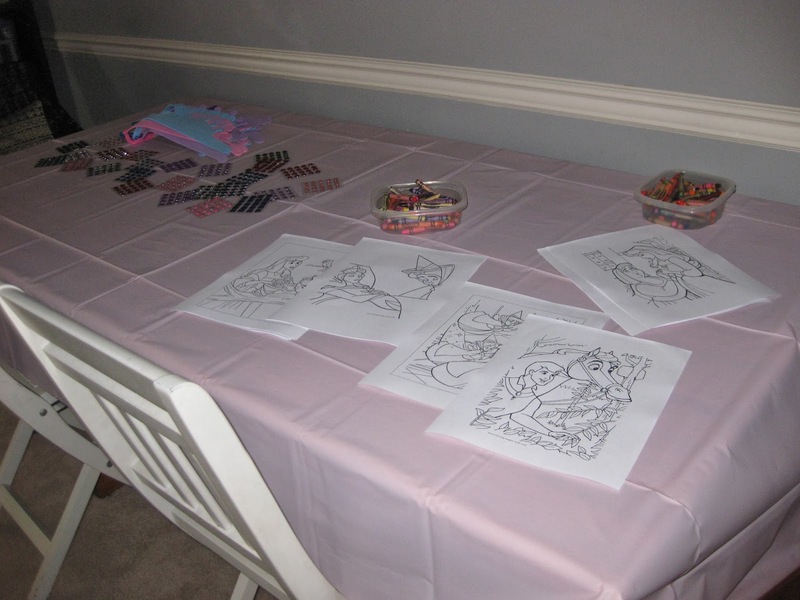 She loves all the princesses, but after wavering between Sleeping Beauty and Snow White, and once she saw that a Snow White party would have used the colors blue, yellow, and red, and no pink, she was definitely all for a Sleeping Beauty party. I was surprised to find that there’s not as much out there for Sleeping Beauty, but I guess she’s not one of the most popular princesses. 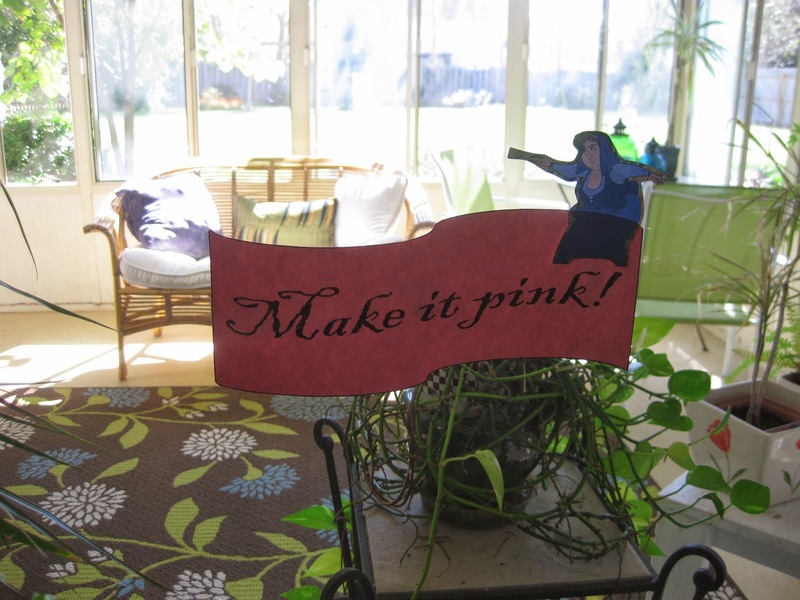 I got a few of my ideas from an awesome party I found on Pinterest: Hostess with the Mostess. 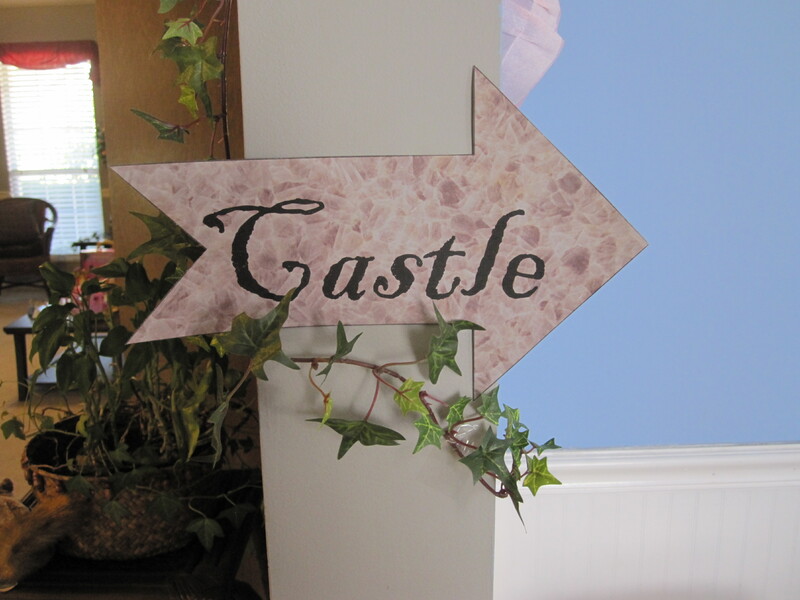 Our family room and kitchen were the castle. 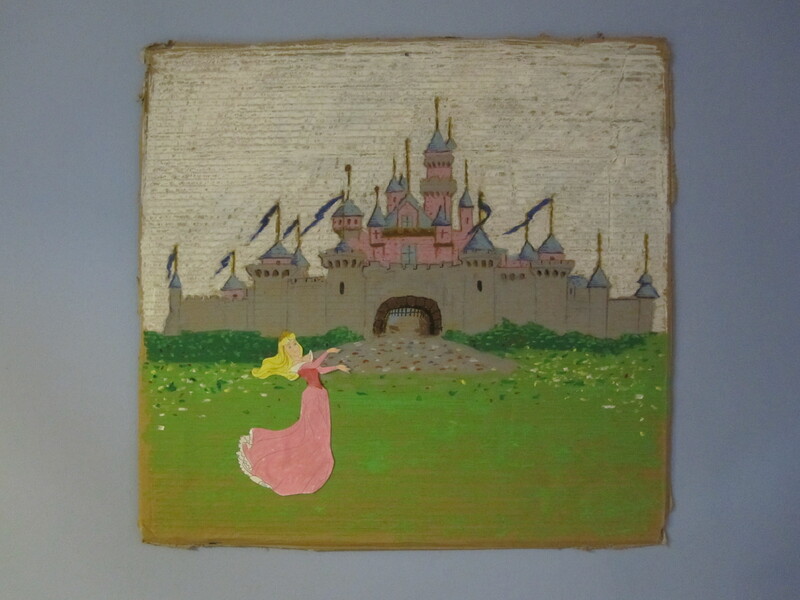 My awesome artistic husband drew this Sleeping Beauty castle with oil pastels, and it’s hanging now in Little E’s room. I always add some decoration to my kids’ rooms after their parties at their request. Their rooms are becoming more and more eclectic! 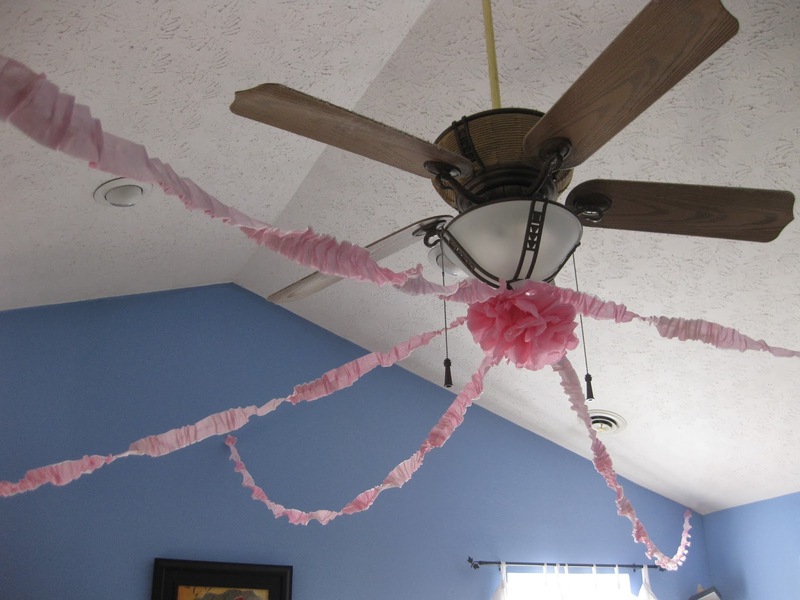 I found a tutorial to make ruffled streamers out of crepe paper, which I loved! 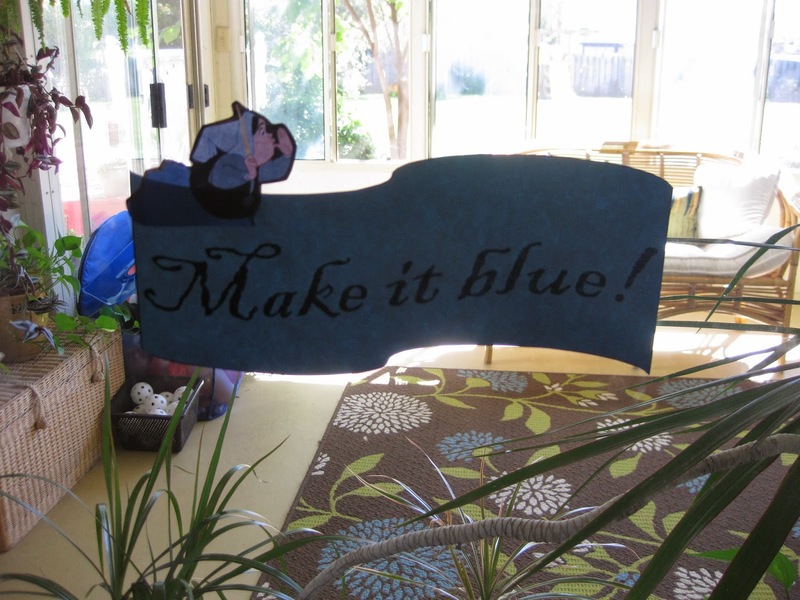 It made the crepe paper almost look like fabric–much prettier. 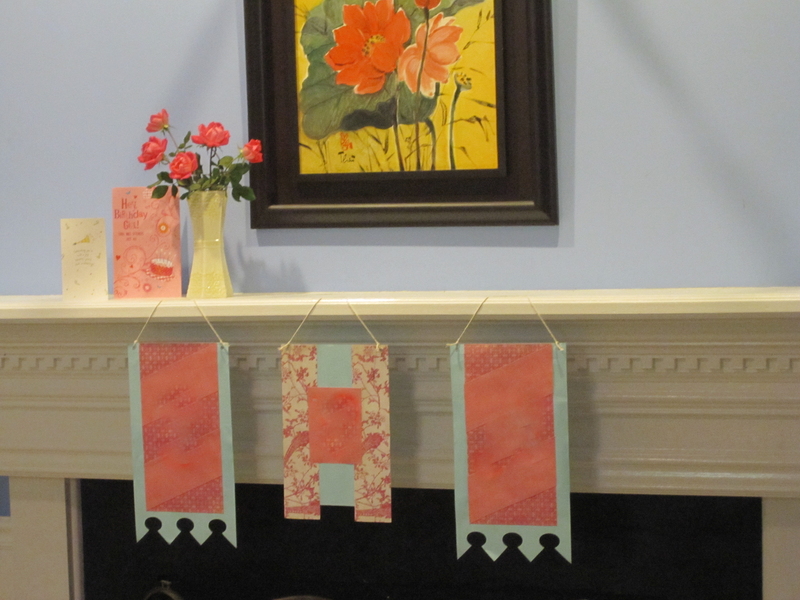 I started to make them, but I was running out of time, and my wonderful mom was in town, so she made them for me! 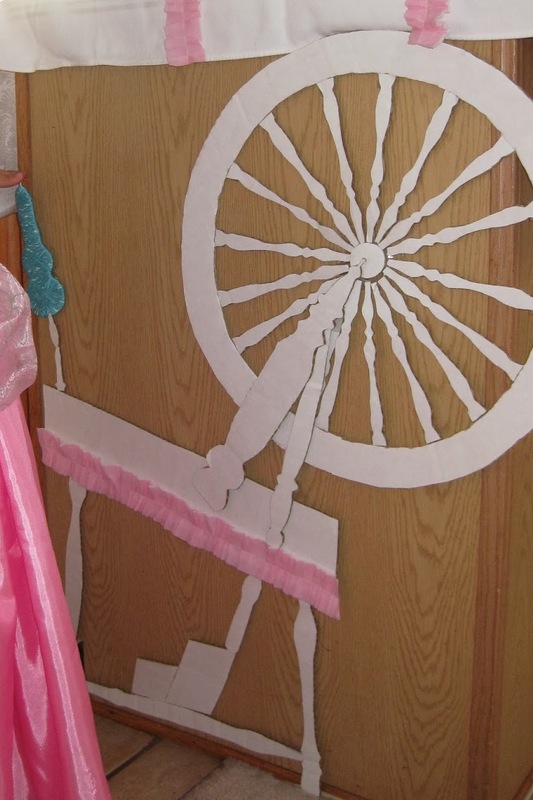 I cut this spinning wheel out of white cardboard–my fingers didn’t feel too good after finishing that! Our living room was the Enchanted Forest. 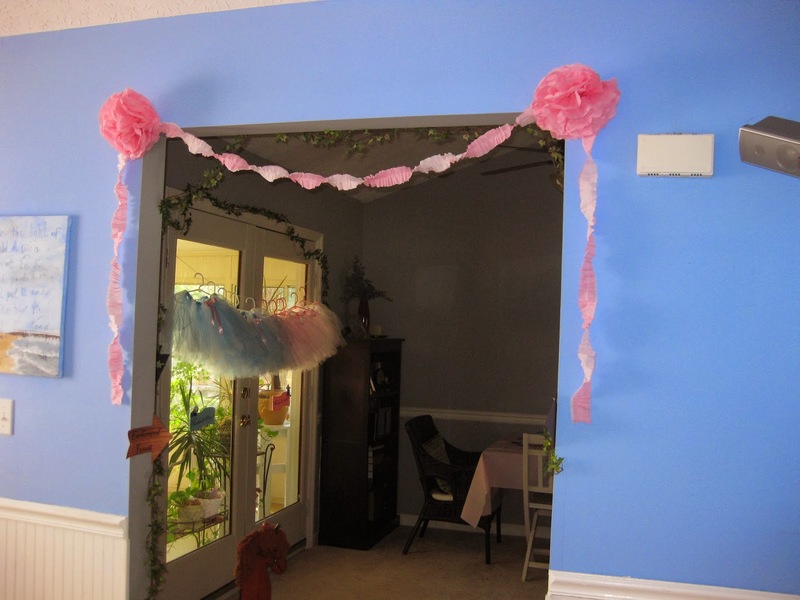 I put up strings of fake ivy (leftover from a family member’s wedding–thank you, Sharon and Allyson!) throughout the room to help suggest a forest. 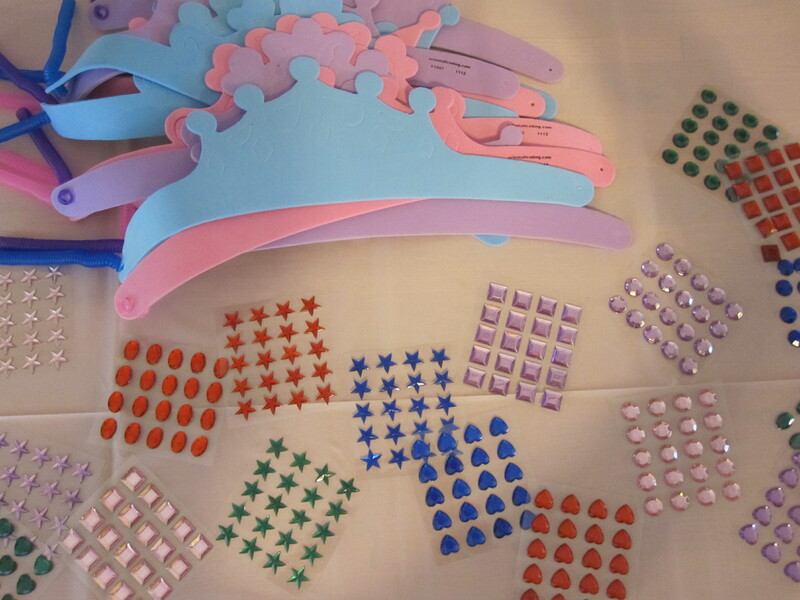 Several of them spent a long time playing with an assortment of princesses in Little E’s Sleeping Beauty castle. 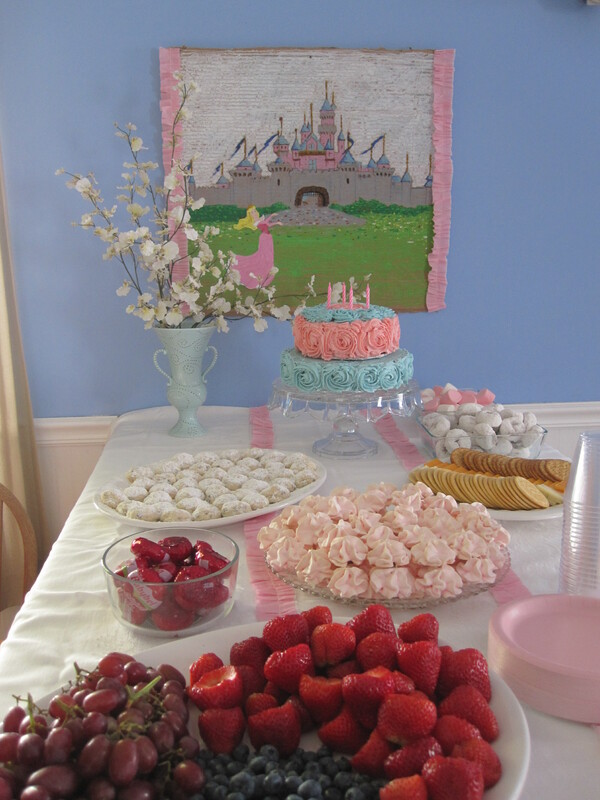 Next, they headed into the kitchen with their decorated crowns to decorate their own cupcakes–think Fauna and the cake she made for Briar Rose on her 16th birthday. 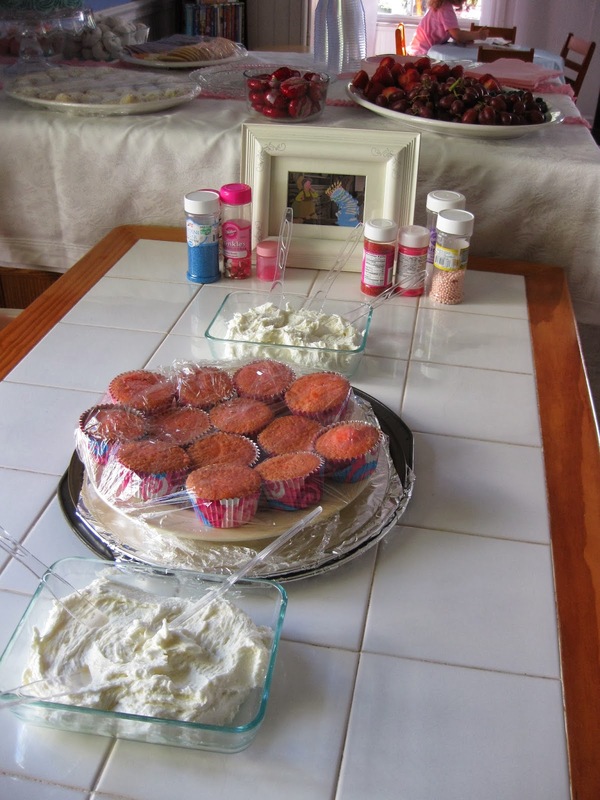 There’s a tiny picture of her at the end of the decorating table. 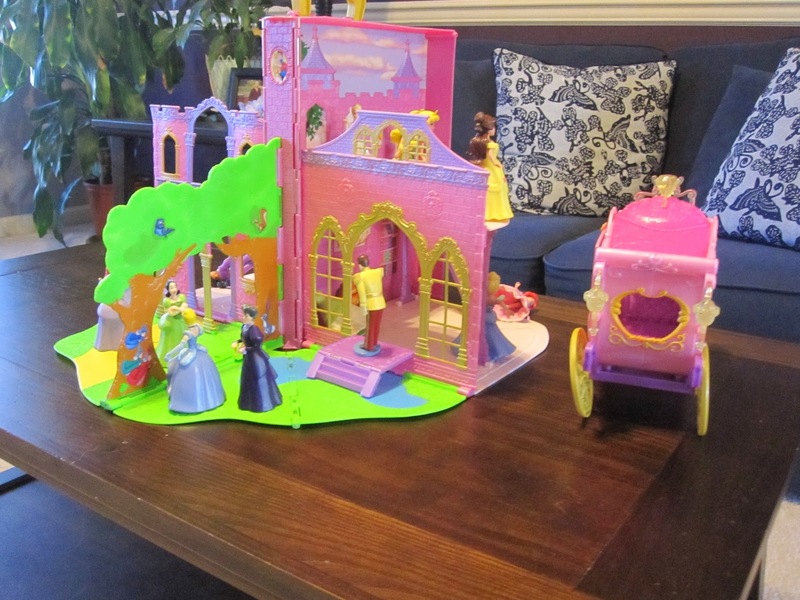 After that, we played “Who Woke the Princess” from this website, which is just like “Heads up, Seven up.” I wish I had pictures of that game because it was so cute! Three girls came up front, and the rest of the girls lay face down on the ground (so they wouldn’t look). While the girls had their eyes closed, the three up front each picked one “sleeping” girl by gently touching her head. After the girls went back to the front, everybody “woke up.” The ones who had been chosen had to stand up and decide who had chosen them. If they got it right, they got to go up front next. It was a fun game for them! We also let the girls watch the movie Sleeping Beauty, but I did have to fast forward through some scary parts for the littlest ones. While the movie was playing, Little E opened her presents. It kept the girls from mobbing Little E while she opened presents, but it had a drawback–at one point, Little E was so interested in the movie that she didn’t care about her presents. She opened one present while watching the movie the entire time. She never even looked at her present as she pulled it out. Most of the time she had fun opening her presents, though. I loved the idea my friend had at one of her parties to take a picture of the girl who gave the present with the present itself. It made thank you cards easier later, helped Little E see exactly who gave her the present so she could thank her, and I was able to get a picture of every guest! 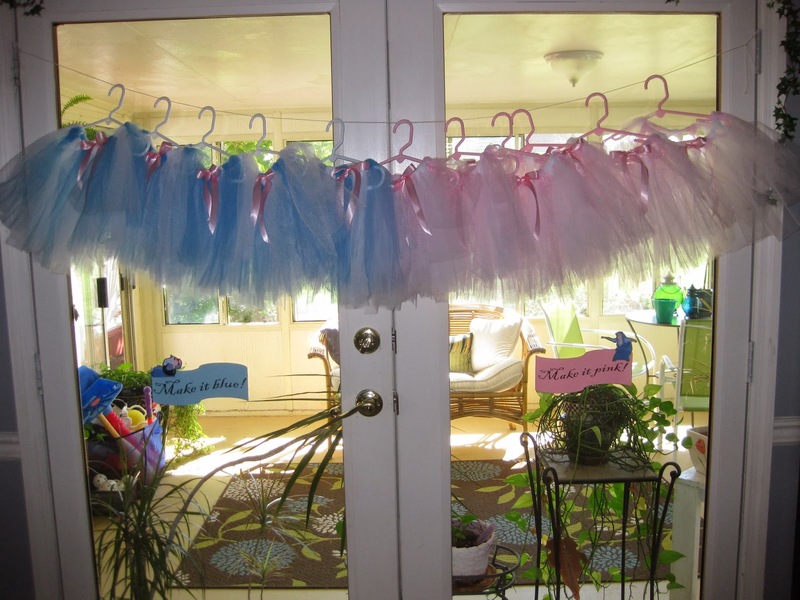 As a party favor, the girls got to pick a tutu (“Make it pink” or “Make it blue”), partly made from tulle leftover from the same family member’s wedding! The tutorial I used for making the tutus is here. 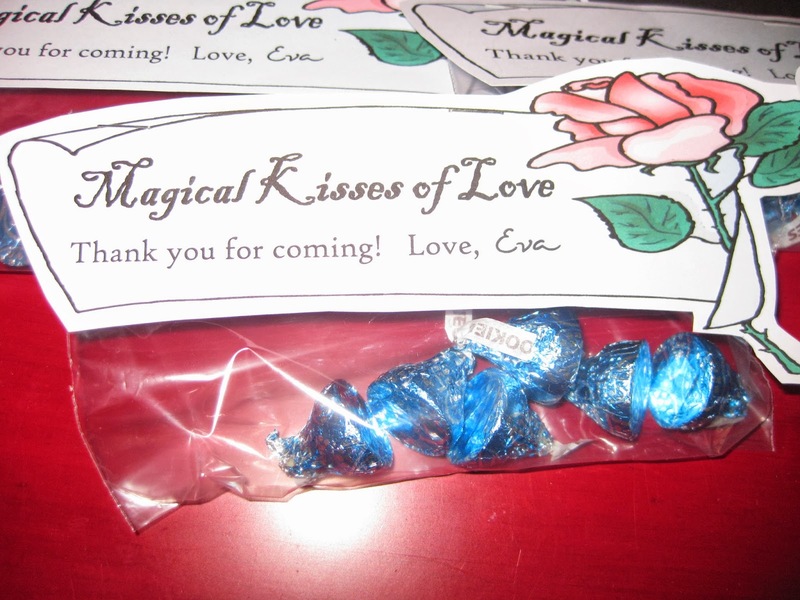 I got this idea from this blog to give out as extra little favors. 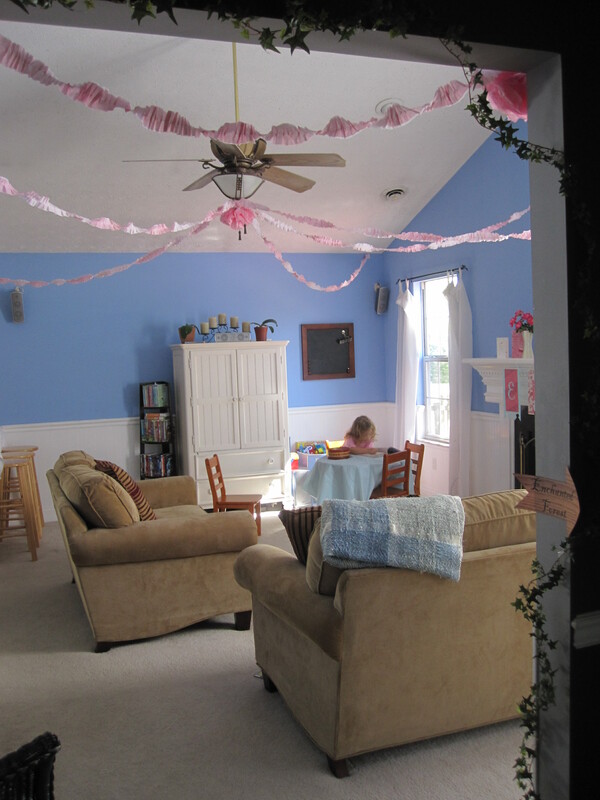 I love decorating for parties, but it sure is a lot more fun when your kids are old enough to enjoy it with you. 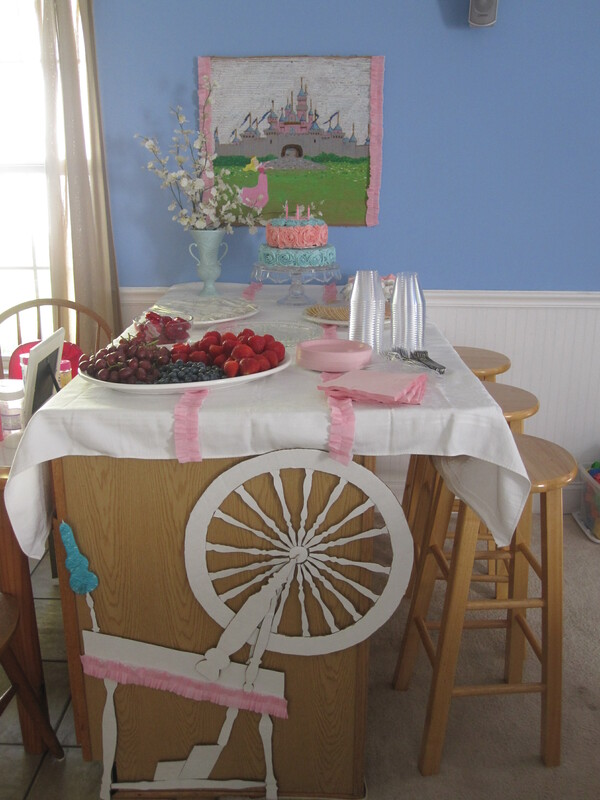 I loved decorating for someone who believes she’s a princess living in a castle half the time anyway. 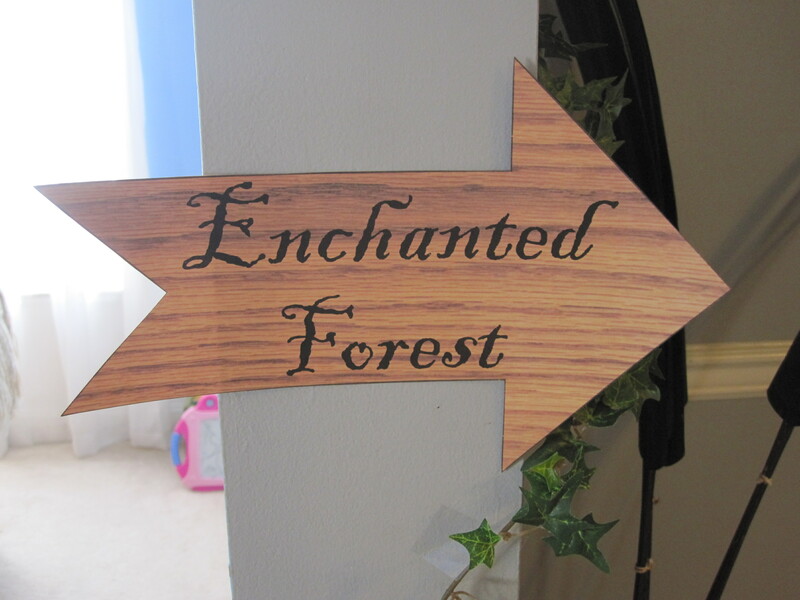 She loved going into the “Enchanted Forest,” and helped me pick out woodland creatures to live there. 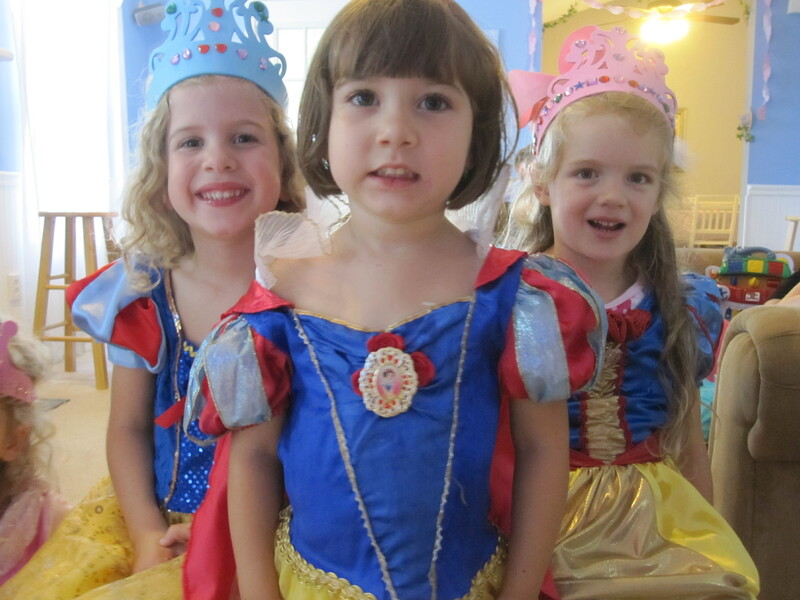 Little E had a great time, and what’s better, she felt relaxed with all the girls who came–free to be her silly self!